We offer custom-crafted giclée prints of the highest quality, along with special presentations such as metal and face-mounted acrylic printing, for many of our images. To preserve our body of work, these are the only methods of printing we allow for our most valued images. Additionally, some prints are available only in numbered, limited editions. The term "giclée" was coined to differentiate between various inkjet printing technologies as they were evolving during the early 1990's. As it is commonly used today, and as we use it, a giclée print is one that is made using inkjet technology, employing high end (usually large format) printers with archival inks and media to produce long lasting prints of very high quality. Office and home inkjet printers, although they use similar technology, can not produce giclée prints. To provide a more affordable alternative, we offer prints of some images through a commercial printing lab, directly via this website. These prints will not be custom-crafted, nor will they meet those standards for quality and longevity, but you can expect high quality printing at a fair price. If there is a "BUY" option adjacent to an image you can order commercial lab prints directly via this web site. If there is no "BUY" option you will need to arrange custom printing directly through us. Printing options are numerous and some images are better suited to one approach than another. 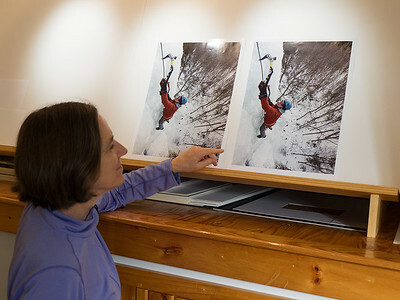 We want each of our prints to exceed your expectations when you display it. To that end, we invite you to inquire about the most suitable options for your particular situation. Most snapshots are soon forgotten so social media or web galleries are perfectly adequate for these short-lived images. For many photographs this is all that is needed, but for images with long-term sentimental, archival or artistic value, printing has some advantages. Most importantly, photos displayed transmissively (on a screen, lighted from behind) look completely different from those displayed reflectively (on paper or similar media). The very best high-resolution, wide-gamut screens, although convenient, don’t even come close to the colors, tonal gradations, and detail that can be seen in a good print in good light. And a truly excellent print in great light lives in a class by itself. 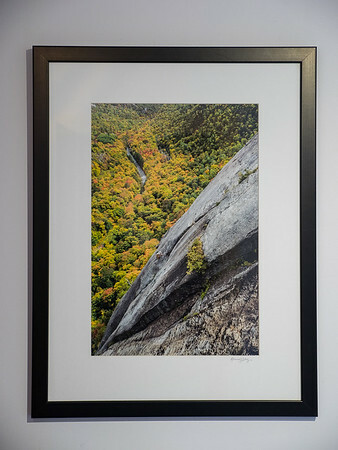 In your hands, or hanging on a wall, prints offer a viewing experience that’s easy to appreciate. Cheap prints may not be worth the bother if they are of poor quality or only last a few years, but high-volume machine prints achieve their low cost by cutting important corners, including print quality and longevity. Most consumer inkjet prints will deteriorate quickly as well. Fading colors and ugly, brown acid-burned paper and mats become annoyingly obvious after a few years when cheap materials are used. If you plan to toss out your prints after a few years this won’t matter but maybe a web gallery would have been a better choice in that case. Only you can decide. On the other hand, some quality-oriented commercial printing services, such as the lab we use as an affordable alternative to our custom-crafted prints, offer reasonably long-lived prints at fair prices. Lightjet prints (a hybrid digital/traditional wet process) can produce very good, but rarely great, reasonably long-lasting prints, at attractive prices. 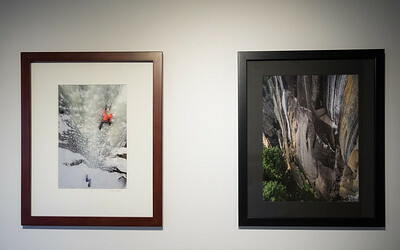 Many printing companies also offer a variety of presentation and mounting options that might fit your needs quite well. Face-mounting on acrylic, printing on metal, or a variety of other mounting and laminating options can make for very attractive results. Some mounting methods impact longevity more than others so it’s worth looking into the specifics. While none of these options is reversible (a requirement for truly archival prints), nor do they feature the longest possible lifespans, they are more than adequate in many cases. Again, only you can decide. For really important images, top quality archival prints are worth considering. Fine art photographs and any other images that have substantial monetary or sentimental value fall into this group. The materials required to produce very long-lived prints are much more expensive and account for the significant price differences. Acid-free papers (sometimes buffered for additional protection) and mounting materials, archival inks, and a host of other considerations produce results that last much longer than the cheaper options. Some archival prints may be rated to last up to 200 years, without deterioration, under the right conditions. Also consider that investments in meticulous color correction, image optimization and other post-processing, that simply can not be performed automatically by any software, start to make a lot more sense when you are already paying for a top quality, long-lived print. To meet the archival requirement of reversibility, a traditional mat and frame or gallery wrap treatment is the norm. For our favorite images, to protect our body of work, we maintain control over the process, from the moment the photo is created through to the finished product. 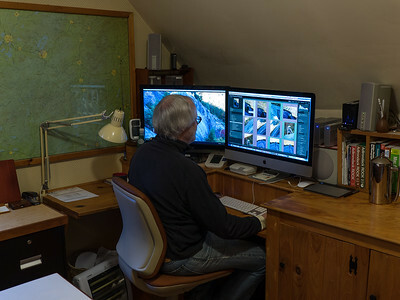 Starting with a high quality digital file, or occasionally a digital scan from film, each image is meticulously adjusted, by us, to emphasize what we saw and felt at the moment we made the photograph. Because these qualities can not be captured by a camera alone, no matter how sophisticated it might be, we employ a variety of image optimization software to bring each of our photos to life. Processing of our images is aimed specifically at coaxing out the most visually interesting parts of what we actually experienced when the shutter clicked. Nobody can optimize an image to reflect its original inspiration except the photographer who actually made the photo. Allowing others to adjust, then print, our work would be tantamount to permitting a second artist, whose sensibilities may differ widely from our own, to alter the vision that inspired us to make the photo in the first place. Our best work would no longer be our own if we chose this path. If one of our photographs resonates with you in a deep and meaningful way then we have succeeded in connecting you with the vision that compelled us to create the image and, from an artistic standpoint, that’s our ultimate goal. Whether that connection is grounded in reality or abstraction, we are always eager to explain how each photograph we print was made, including when and why we might have departed from reality in favor of a more abstract interpretation. We hope our photographs will amaze but they are never intended to deceive. For our custom-crafted giclée prints, once we are satisfied an image is ready for printing, we select the printing media and printing equipment we think will best complement the photograph. In our studio, we maintain professional grade, large format giclée printers from Epson and Canon, allowing us to choose the most suitable technology for each image and paper combination. Each of these printers uses state-of-the art, archival pigment inks for maximum print longevity. 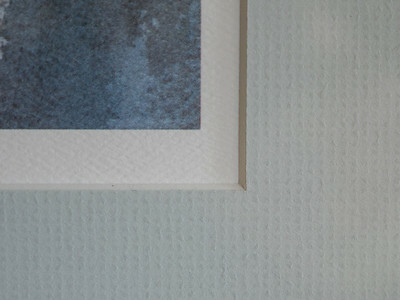 We can print on Photographic Papers (glossy, satin or lustre), Fine Art Matte Papers (hot and cold pressed) and Canvas. We are capable of printing images on papers up to 24” x 36” (or longer in the case of panoramas), resulting in framed images up to approximately 28” x 40”. We can print diptychs or triptychs on canvas even larger. We also have an assortment of specialty papers (metallic, film, etc.) available for special circumstances. All our printing media are archival, some of which are rated to last for more than 100 years with no visible deterioration. Normally, we choose the paper and printing technology (piezo or thermal) we think will best complement any image we print, but we are willing to discuss alternatives if you have specific preferences. 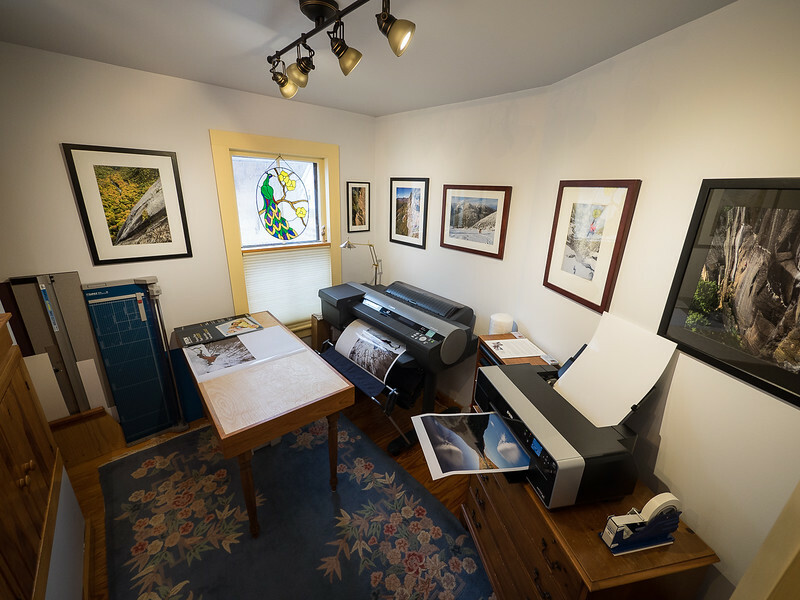 Quality fine art giclée printing requires very expensive and finicky equipment along with an inventory of papers, and a surprisingly long learning curve, to make it all work together. 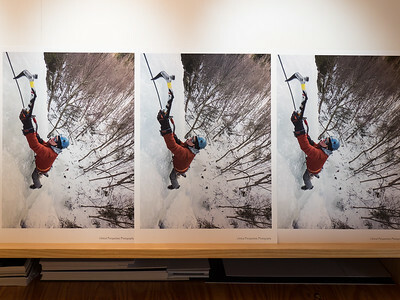 Even a precisely calibrated, color-managed workflow that is out-sourced for printing will never result in the print quality obtainable by skilled photographers who insist on meticulously printing their own work using high quality materials. We do all our own custom-crafted printing so what hangs on your wall accurately reflects what we envisioned. For our best work, nothing less is acceptable. 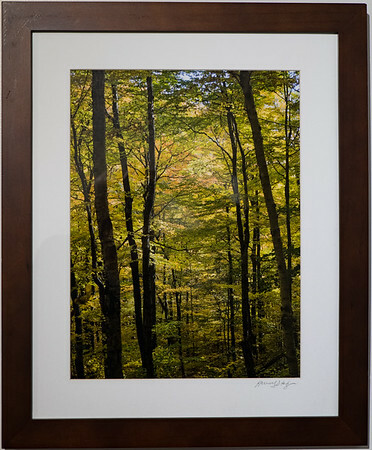 Our custom-crafted prints can be sized to fit, after matting, into standard frames, or we can print to your specifications for larger, smaller or other print requirements. Prints on canvas are normally gallery wraps, intended to be displayed without a mat or frame. The specific image and the printing media may limit sizes – please inquire. 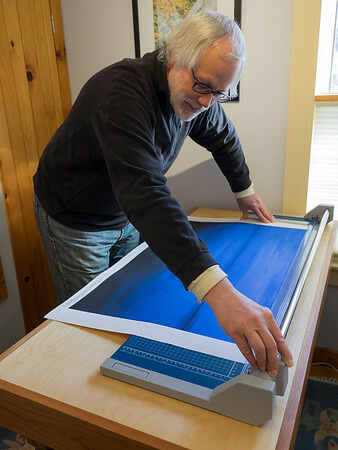 Our custom-crafted giclée prints are guaranteed, with proper care, to last as long as you do. Exposure to direct sun, high humidity or airborne contaminants, or contact with non-archival materials will ruin any artwork and are excluded from this guarantee. We want you to enjoy your print for many years to come so feel free to inquire about how best to display it. Our prints are available unframed (rolled in tubes) or, for some sizes, matted and framed. If shipping is required we’ll send your print unframed and you can arrange to have it framed locally. 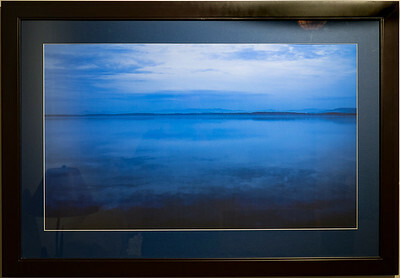 If you are able to pick up your print at our location we can frame it, or you can choose to have it framed elsewhere. 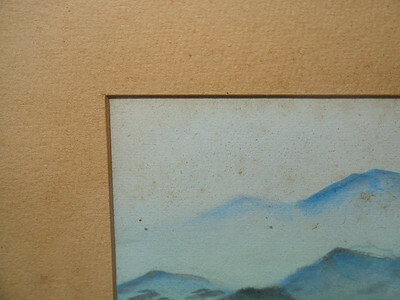 We mat our prints using conservation grade archival backing and single mats (usually white), then we place them in basic frames (usually black) with standard glass. This simple presentation suits our display requirements and, if it meets your needs, we’d be happy to frame your print. We usually have a small selection of other mat colors and types available but we do not maintain the kind of inventory you'd expect to find at a frame shop. If you have specific mat requirements (exact colors, double matting, etc. 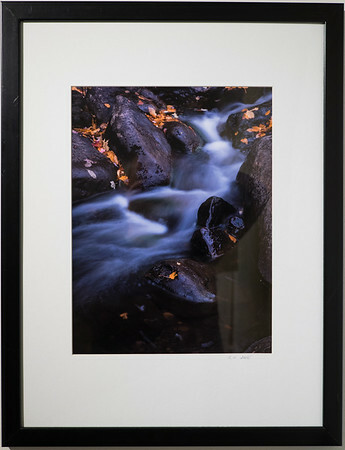 ), if you prefer special glass or acrylic, or if you want a frame other than what we have available, you will need to have your print framed elsewhere. Stretched canvas gallery wraps, in single image, diptych or triptych formats, are available for some of our images. They offer a lightweight, uncluttered presentation in larger sizes than traditional framed prints, however canvas is usually not a good choice for images that rely on fine details. Pricing for canvas prints is based upon each specific presentation. Please inquire. In recent years printing on metal, face-mounted acrylic prints and other special techniques have become popular because of the striking impact these presentations can produce. These printing methods require large investments in specialized equipment, along with a high-volume production environment to make them cost effective. Because the print is permanently mounted on its display surface it does not meet true archival requirements but, for most people, that is offset by the striking impact of the presentation. Lifespan for these methods is not as well understood as for traditional paper prints, which can thrive for more than a century, but several decades would be a fair expectation in most cases. When we prepare images for this type of printing we do all of the optimizing and adjustments ourselves, relying on “soft proofs” to get as close to the final product as we can before sending the files out for production. 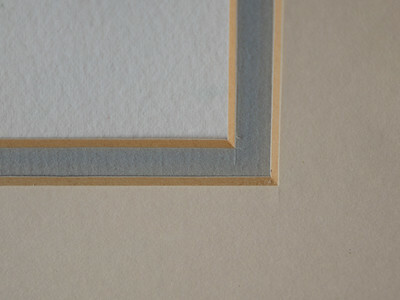 We’d prefer to keep everything “in house”, as we do with our giclée prints, but that is not possible. Fortunately, these presentations are usually best suited to dynamic, saturated images that do not rely heavily on finely-tuned tonal gradations. Because they are not produced directly by us, and because they are intended to be displayed without mats or frames, size options for these prints are different from the giclée prints we produce "in house". Guarantees for these special presentations are provided by the manufacturer. As we pointed out earlier, a good print offers a very different viewing experience from what can be obtained on any electronic screen. We have some of our prints on display, with appropriate lighting, in our small studio and in our home. We also display our prints in local establishments from time to time but we do not maintain a permanent gallery presence. If you are interested in viewing our prints, we'd be pleased to arrange for you to do so in our studio.